Now, lets discuss all of the above. Palin insists that Murkoski attacked Miller's military honor in her questioning how he is living up to his decorated service with his lies and ethics violations. It seems that even questioning a veteran would be enough to set Palin off, but it is a perfectly legitimate line of questioning - it's not like Murkowski was the Swift Boat Veterans for Truth, which the right had no problem supporting six years ago when they attacked decorated soldier and presidential candidate John Kerry. The other thing in Palin's note is her assertion that the crowd booed when "she again challenged Joe Miller's honor." The Right Scoop also references a booing, but if you watch the video, you will notice that the Murkowski received an applause for her statement, where she stated Miller was "not fit to lead." I did hear what sounded like it could be a little booing but it definitely was not the "loud boos" The Right Scoop describes, but of course Palin would join in on this lie because it helps support her agenda and Miller's campaign, which is somewhat of a reflection of Palin's political power. Also, if you think about it, each candidate received an applause after they spoke. Miller, in my opinion, got the loudest of the applause, with nobody booing. When Murkowski was finishing up her comments, it sounded as if some people started to boo and then there was an applause. 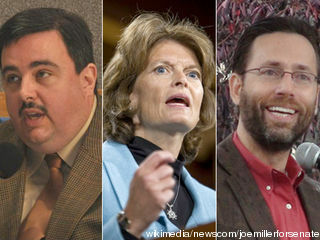 It makes me think that it was Miller supporters who were behind the booing to make a scene giving the appearance that Murkowski is not well liked, but considering reports that Murkowski's write-in campaign looks like a possible frontrunner, it is no wonder why the Miller fanatics are willing to do anything to win (like run from the press and handcuff journalists asking questions - read the report of an eye witness and former Miller supporter here). This debate was also interesting because Miller actually attended it - he has skipped out on a couple others because of his belief that those holding the debates are being biased against him and his campaign. Channel 2's News director Steve MacDonald moderated the Senate debate among Republican Joe Miller, incumbent Sen. Lisa Murkowski, who is running as a write-in candidate, and Democrat Scott McAdams. MacDonald pointed out that many Americans are angry over what they say is an out-of-control federal government, and asked the three candidates how they would cut back on federal spending. "What we have to do as Alaskans is, we've got to fight as hard as other leaders in the state but fight in another direction -- rather than for the earmarks, for the resource base we have," Miller said. "If we put as much effort behind that effort for resources as we did earmarks, this state can create an economy that we need to make sure we have jobs." "The fact of the matter is, if we eliminate earmarks, what that means is that federal spending continues; we're not going to be saving a dime of it," Murkowski said. "What it means is that those in the agencies, those unelected bureaucrats will be setting the priorities. The priorities that they have in Washington, D.C. are most often not in alignment with what's happening here in the State of Alaska." "There are some things, I think, in federal spending -- I think a 3 percent cut in discretionary spending is something we could certainly look at," McAdams said. "But you don't balance the federal budget on the backs of kids, on the backs of rural communities, on the backs of seniors, while we continue to give tax cuts to the richest 1 percent of America, multi-millionaires, and tax loopholes to multinational corporations." I think both Murkowski's and McAdams' responses were pretty decent, but I think Miller's is just a bunch of typical tea party talking points. Miller wants to open up resources in Alaska for development but the federal government stands in his way - the federal government currently controls 242 million acres of land in Alaska. Miller uses natural resources (oil) as a jobs issue. I love how this celebrity entertainer keeps pushing her fans, majority of whom are probably not Alaskans, to donate their hard earned money on a potential candidate that will most likely not have any impact on them. Also of note, is that Murkowski was not questioning the honor of his service. She was questioning his actions after serving and how they do not live up to the HONOR of his decorated service. Basically complimenting him and his past duty as a soldier and how his actions are discracing all that he stood before.